Following the success of his debut book, Seven Simple and Slightly Silly Stories, John Foley’s second collection of darkly witty short stories for adults and children, Another Seven Simple and Slightly Silly Stories, is now available to buy – with 100% of the profits donated to Mencap, a UK charity working to improve the lives of those with learning disabilities. In his new collection, Foley presents another set of seven charmingly quirky and remarkable fables, inspired by his time living in Hans Andersen’s house in Copenhagen. In each magical tale, Foley brings new, wondrous worlds to life, transporting you to universes in which hotel lifts talk (‘Going Up, Going Down, Going Out’), puddles have feelings (‘The Snooty Puddle’) and reindeer learn to read (‘The Wisdom of Teaching Reindeer to Read’)! these short stories is something to be treasured. But each delightful story carries an important and surprising sting in its tale. Demonstrating the true magic of story-telling, Foley’s twists and turns imbue his extraordinary tales with wisdom, revealing a deeper meaning that’s anything but ‘silly’. In Foley’s own words, these stories have been written for ‘the young at heart aged 10 to 110’ and showcase the power of reading and story-telling to develop empathy, identification and learning, at any age. With this in mind, Foley has pledged all profits from the sale of Another Seven Simple and Slightly Silly Stories to Mencap. As the leading voice of learning disability, Mencap strives to transform society’s attitudes to learning disability and to improve the quality of life of people with a learning disability, their families and carers. 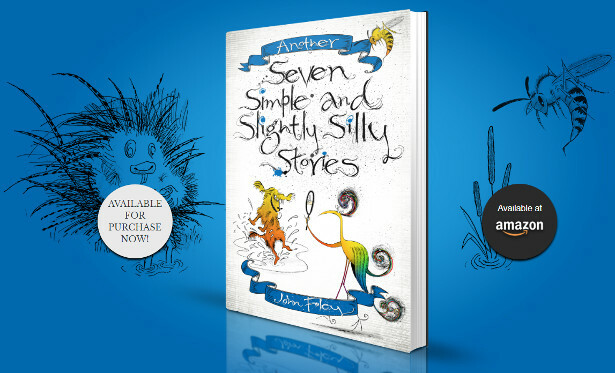 Another Seven Simple and Slightly Silly Stories is available direct from www.quizzicalworks.com at £7.50 (p&p included); also from bookshops and Amazon. After years of stage work as an actor, he turned to writing and radio. He has scripted and voiced more than 600 programmes for BBC English/World Service. Other audio work includes adapting numerous plays by writers such as Alan Bennett, Ronald Harwood, John Osborne, J. B. Priestley and Victoria Wood for World Service Drama and Radio 4. 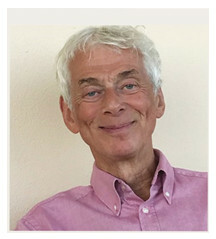 John has also produced more than 70 audiobooks for Macmillan, Naxos and Random House, mainly of unabridged works by Boccaccio, Byron, Theodore Dreiser, Thomas Hardy, Henry James, Rudyard Kipling, D.H. Lawrence, Salman Rushdie, Anthony Trollope, H. G. Wells, Virginia Woolf, and many others. John’s other published works include several recreational reference books, a volume of musical anecdotes, stories for Disney comics and a number of graded readers for children.